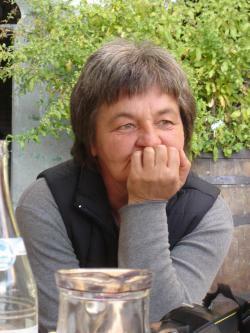 Rossese of Dolceacqua is a wine produced in Western Liguria, and exactly in Nervia Valley in the province of Imperia. This wine takes its name from the village of Dolceacqua. It seems that Pope Paul III Farnese adored this wine. Rossese Dolceacqua, which has had the DOC denomination – is produced with the Rossese quality grape: The D.O.C (with DPR 28-01-1972) is well-deserved both from the point of view of long tradition of the growing area (favorably exposed slopes) and for the authenticity of the vine (probably of French origin), introduced in late 1200. The vine Rossese is grown as tree as required by the Mediterranean tradition, so that during the summer the crown of the plant shades its foot and root, protecting them from the sun during the hottest hours. The bunches are of medium size, truncated-cone shaped and medium compact. The grapes are small, with thin peel, reddish-purple colour, slightly waxy. The leaves are large, equipped with five lobes. 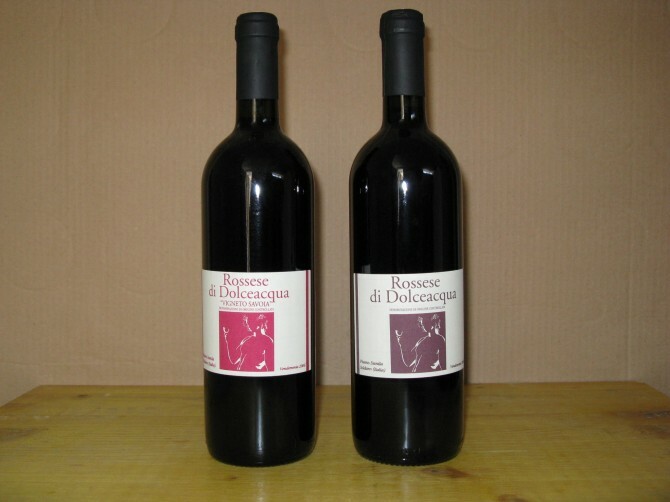 Rossese di Dolceacqua, a wine of ruby red, fruity flavor, soft, fragrant and full-bodied and intense. Can be matched to white and red meat, but can also be enjoyed at other times of lunch (first course, cheese, etc..) or with certain types of fish. Given the small production, the bottles of Rossese Dolceacqua are found almost exclusively in the area. The demands of local market geared to a young product, light, to be consumed over 2-3 years without making it too old. However, the best selections are ennobled by the medium and long aging: there is indeed evidence of vertical tasting going back in time to a wine over 15 years: heritage perfume evolves in such cases to give up priceless feelings olfactory ranging from rhubarb to leather, from pepper to incense. Served at a temperature between 16 and 18 degrees, some like to drink it, though young, and cool. The superior status should have minimum age of 1 year and a strength not less than 13 degrees. The wine Rossese Dolceacqua, when fully expressed, has some visual, tactile and aromatic that relates him to Pinot Noir, eventhough the grapes are not genetically related. The scent is mild, fragrant and flowery when young, and, if properly aged it becomes intense and persistent, with complex hints of dried rose and wild strawberry. In the mouth the taste is very tannic, with substantial and elegant flavor with a characteristic bitter aftertaste. The simplest structure may be very light, while the best selections express volume and softness in the mouth together with a quite high alcohol content. Best served with: the traditional goat stew with beans, stuffed goat, lamb, rabbit with herbs, veal, terrine of pheasant, guinea fowl with mushroom cream and cheeses of the Nervia Valley. Best served at the table of every day: while young, red meats, tuna fish, if aged, with all those dishes with moderate fat or sweet, that go beautifully with the spicy flavor and natural blend of Dolceacqua Rossese .